An image of screenshots from the NYC Application Guide created by the Heckscher Foundation for Children with help from NYU researchers. MANHATTAN — To help low-income students pick the right high school, a foundation teamed up with researchers at New York University and a former city director of high school admissions to create a new app — deciding only to include schools with at least a 65 percent graduation rate. As part of an effort to encourage kids to aim higher, the choice to only include schools with better graduation rates meant cutting nearly a fifth of the city's high schools, explained Peter Sloane, chairman and CEO of the Heckscher Foundation for Children, which is dedicated to leveling the playing field for underserved New York youth. “Our hope is that students in the eighth grade, who may not have the same level of help or family support to help them select a high school, can benefit from having this customized tool to help them make a better choice,” he said of the NYC Application Guide. Of the nearly 77,000 eighth-graders who applied to roughly 700 programs in more than 400 high schools last school year by the Dec. 1 deadline, 46 percent were matched with their first choice, and 72 percent received an offer to one of their top three, according to the Department of Education data. But researchers question whether certain students have the right tools and information to select the schools that would serve them best. The city’s high school admissions process is notoriously cumbersome, and even though the process was designed to be fair, most parents and education experts say the system favors families who understand how to navigate the complex system. Parents with social and economic capital, who can devote time and energy to taking off from work to research options, snag limited spaces at school tours and can help their kids craft admissions portfolios or go on auditions and interviews to get a leg up. However, disadvantaged students tend to opt for nearby schools and are less likely to include high-performing schools on their lists of preferred schools, research has found. To get the app’s personalized list of potential high schools, students answer six questions, entering their home address and how long they want to commute, as well as listing their interests in academics, sports and other extra-curricular activities. The app’s search algorithm accounts for the students’ geographic preferences and historic demand for schools to consider a student’s likelihood of admission. In the initial customized list of recommendations, only the schools with graduation rates above 65 percent will appear. The app serves as a key component to an ongoing, multi-year admissions study of New York City high schools, led by researchers from NYU, Princeton University, Columbia University and Seton Hall University. The study, one of the largest randomized control trials on information supports for school choice, is hoping to better understand whether tools like the new app can help students make more “ambitious” choices, ultimately resulting in better outcomes for high school and college. Last school year, 420 middle schools across the city were involved in the study, Corcoran said. 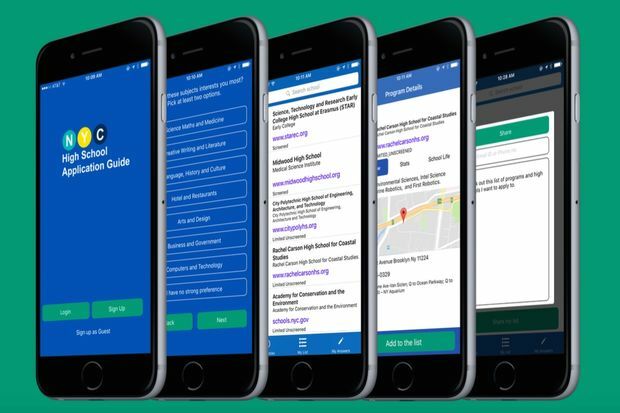 Students at roughly 80 schools were introduced to the app, while those at another 80 schools were introduced to the DOE’s digital high school directory tool, called NYC School Finder. That platform allows families to search for schools by location, size and other criteria on their smartphones, though Corcoran noted that it does not have the same focus on graduation rates as the new app. Other students were targeted with paper-based tools. Findings from the study are expected in early 2018. Nadia Selby, director of program at Citizen Schools — which partners with public middle schools in low-income communities to provide an expanded learning day — introduced the app to students at schools in East Harlem and Clinton Hill when it was being piloted two years ago. She was hopeful that it empowered eighth-graders when it came time to rank high schools. Many kids in the schools where she works do not do much research about what options are out there or which schools best match their interests, especially since the DOE’s 500-page high school directory is so massive, Selby said. In trying to address concerns about the complicated high school admissions process and how it ends up segregating students in many schools, the DOE hopes its NYC School Finder will help. More than 130,000 users have visited the site, spending an average of 7 minutes on it, according to DOE data.